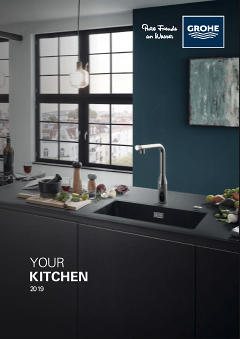 The GROHE K7 range will transform your kitchen – both in terms of functionality as well as design. Developed in cooperation with professional chefs, this sink mixer with GROHE SuperSteel finish comes in a mat stainless steel look and incorporates a variety of convenient features. Its pull-down comfort spray head allows you to switch easily between a fine spray jet and a powerful shower jet, for effortless cleaning of the entire sink area. The tap's high spout makes it easy for you to fill even your tallest pots. Thanks to our GROHE SilkMove technology, control of water volume and temperature is smooth and precise. And, with our easy installation system, you'll have your new tap installed in no time and won't need the help of a plumber to give your kitchen a new, classy look. GROHE K7 – maximum convenience and style for your kitchen!